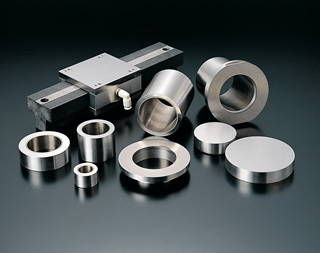 The Oiles Air Bearings are self-lubricating bearings for high-rigidity, high-precision and high-speed applications made of integrated original porous sintered layers and back metals. ■ Almost no coefficient of friction and free from stick slips, enabling positioning control at very high accuracy. ■ Originally developed porous material allows optimum drawing. Demonstrates high load performance and high bearing rigidity. ■ Integration of sintered layers with back metals simplifies machining, allowing manufacturing at low cost. Contains the service range, the test data, and the standard size table, etc.